First of all, my apologies for not writing any new updates on the prep and planning going on for my fall DIY Mule Deer hunt. There has just been a ton going on: My day job (the one that pays the bills) consumes 50-60 hours most weeks, string orders have continued to fly in (Thank you all!!!!) plus I have had two large bulk orders from bowyers come in as well so I am “doing the twist” in the workshop most evenings till near midnight. Plus I admit I have been devoting any free time I could wrangle out of my week into the new “Traditional Outdoors” website (if you have not had a chance to check it out I think you should) and everything that goes with it from recording podcasts, reaching out to potential guests, scheduling and editing audio (new skill I also had to learn) and researching for new content. A huge thanks to Nick Viau for his help with Social Media and the podcast recordings by the way. There just seems to be a limit to how much I can get done in a week but rest assured I have not forgotten about my followers here, nor have I forgotten about the coming fall hunting season either. So during the past month I have also been researching some gear that I have purchased and will be putting together articles for most of them much like I did for My Search for the Right Backcountry Backpack article. But in the interim I really just wanted to throw some of that gear out here to give some insight into my selections so that anyone contemplating similar purchases can know that those articles are coming soon. Thom and I will be using a Seek Outside floorless shelter on this hunt. We have not exactly narrowed down which will be used. Thom already owns and 8 man tipi and I will have one coming soon once I have completed my Backcountry Hunters and Anglers Lifetime Membership dues. With the floorless shelter I plan to use a lightweight moisture barrier, a lightweight inflatable sleeping pad and a synthetic 20 degree bag. At the time of year we will be going I think the 20 degree bag will be plenty but if not I can always sleep in my lightweight merino base layers I plan to wear most of the week. 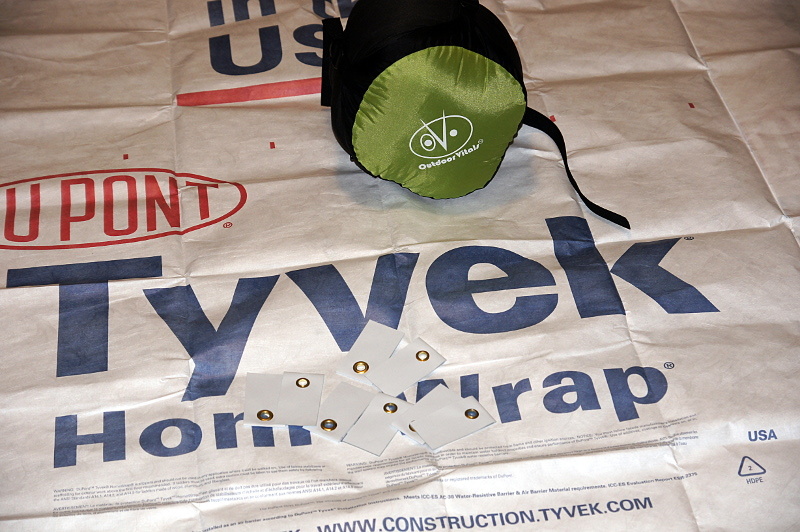 I have not yet purchased my sleeping pad (still researching) but I have chosen to use simply Tyvek for the moisture barrier. I found a large sheet on eBay that I can cut to the size I want and also picked up some adhesive grommets so I can stake the barrier down. Not really much else to say here. Cheap, durable and effective. Nothing fancy needed here. For my bag, I own a Slumberjack bag that I used last fall in various camps and I like the bag a lot but it is just too large and bulky for this trip. Instead I started looking at various offerings and ultimately I purchased an Outdoor Vitals bag. I won’t get into all my reasons here so look for a future post on bag selection but from what I can tell so far I am happy with the choice. This is really the big one and I am working on my notes for this purchase now but it will take some time to actually spend some time in the field to fully evaluate these optics. What I can tell you now is that I LOVE my choice. My hunting partner for this trip, Thom Jorgensen, gave me some useful advice that I will pass along here. “When looking at optics, be sure to spend some time on bird watching forums reading reviews, you won’t be sorry”. Thom was right. I purchased a pair of Maven Optics. B.2 11×45 optics and had them personalized for me. Be sure to watch for the full write up. For the Maven’s I also wanted a Bino harness to carry and protect them. While these will probably spend most of their time on a tripod I made the purchase considering other duties they would be used for which I will cover in the review. But for those reasons I needed a good harness. 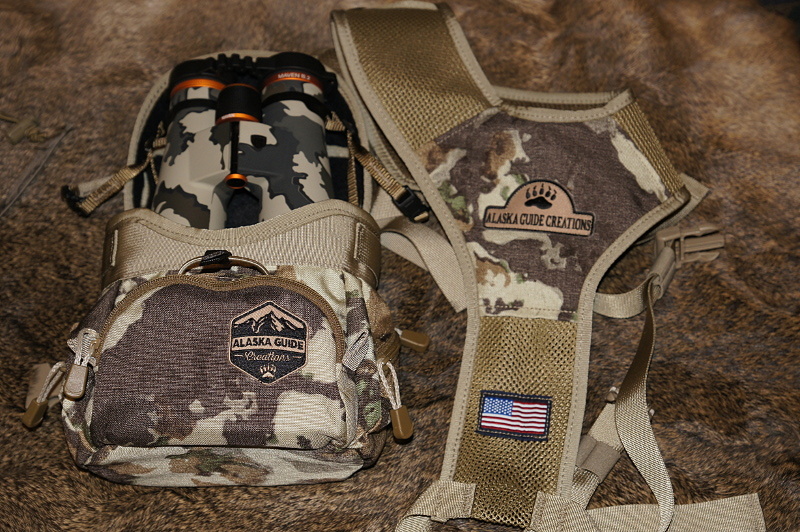 I opted for an Alaska Guide Creations “Classic” harness. It arrived yesterday so the only time I have spent with the harness was to attach the Maven’s and take a photo or two for this post. Thom wrote an article about his ideas around food and what our meals will be while in the Backcountry on his website Trad Bow Safaris. I chose to purchase the same setup as Thom from Solo Stove. We will be using identical stoves and cooking pots and will be carrying in an ample supply of cooking fuel for the alcohol stove. If we run out or start getting low we will always be able to fall back to burning sticks, twigs and other pieces of wood. For this one you can check the article on Thom’s website here. I think that is about it for now. The only piece of gear I still have to buy is the sleeping pad. That does not mean that another “want” or two won’t filter in but I am confident I have everything I NEED to make this hunt work. I will work on these reviews and get them out as soon as I can and will also try to give another update on my “Getting into Backcountry Shape” series soon as well. Until then…….shoot straight!